Hey guys, I want to introduce you all to this amazing nineties print jumpsuit that I scored while visiting my bestfriend in Texas. She has fabulous clothing just laying around, and whenever I'm around I definitely reap the benefits. Since it's starting to warm up, I wanted to get out and take loads of pictures in fun outfits to inspire you guys. So before I started with the fun outfits, I wanted to do a post on a few basics that I recently bought. Sounds good, right?? Nope. None of my basics worked together. I had a fantastic pair of patchwork jeans, a crisp white button down shirt, and my brand new pair of Stans all perfectly paired, but I couldn't get the items to work together in an outfit. My photographer helped me come to the conclusion that maybe basics don't suit me. 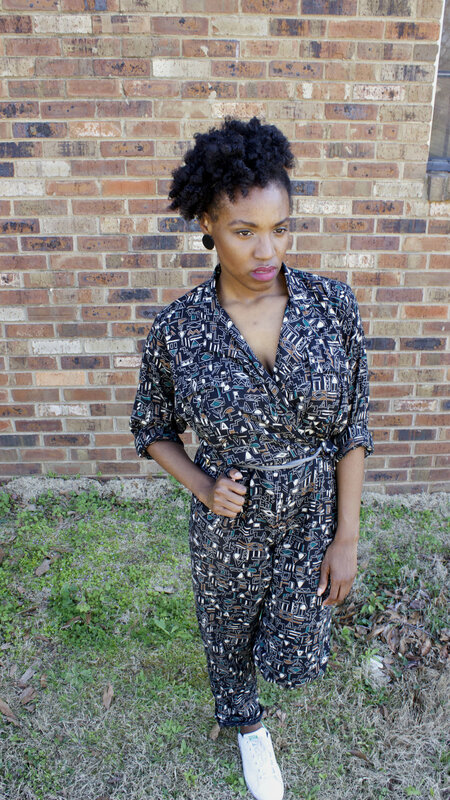 So that's when I went and grabbed this cute little jumpsuit, and opted to pair it with a basic. Instead of attempting to wear all of your basics together, opt to pair them with seasonal prints and colors. Understand that all basics just might not suit you, so don't force it. Basics aren't always black, white, or neutrals - they are your go-to or statement pieces.